A patient diagnosed with malignant pleural mesothelioma may elect to have a risky procedure performed called an extrapleural pneumonectomy. Question: Patient is seen today for treatment of his malignant pleural mesothelioma. An extrapleural pneumonectomy is performed under general anesthesia. The diseased lung was removed, along with the lining of the lung (pleura), lining of the heart (pericardium), and part of the diaphragm. In this case, the right lung was removed. What CPT should be assigned for this procedure? Since the documentation states the right lung was removed, modifier -RT should be appended to 32445, making it 32445-RT. This rule is based on the Medicare Claims Processing Manual, which states the modifiers -LT and -RT should be used whenever a procedure is performed on only one side. Hospitals use these modifiers to report which of the paired organs was operated on. 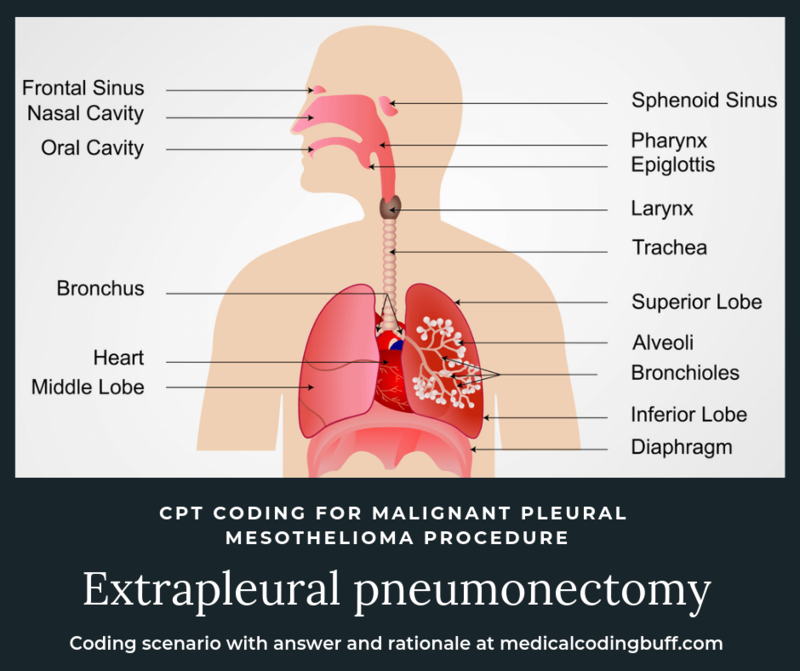 The main goal of an extrapleural pneumonectomy (EPP) is to remove all the cancerous tissue and reroute all the blood vessels to prevent cancer cells from spreading. This can also keep the cancer from returning locally. Because this procedure is considered quite radical and there are risks associated with this surgery, a physician will not usually recommend it unless the patient is in an earlier stage of mesothelioma.